It’s time to once more hide behind flipped tables as you fire up the bagpipes, recruiting more and more Scottish warriors to your cause, each powered by… porridge. No really. Someone has to stop the English invasion of Scotland in Defend the Highlands after all, and unsurprisingly, that tasks has fallen upon you, assisted by the battle-hardened pub owner Alfredo (among other). Okay so in reality, Alfredo’s ‘assistance’ will likely not be felt on the battlefield, as from what I’ve experienced, his role is more that of the tower in need of defense than a fierce warrior. What? Oh. Yeah. I know – yet another tower defense, but hey, at least this one doesn’t have some silly pre-determined path or worse, fixed tower placement. Aside from the oat fields anyway, as those can’t be moved around and you do need to defend anyone working them. If you don’t, your supply will eventually run out, at which point your troops will no longer fight the good fight. At all. Which would be bad. Personally, I’d probably ask for a different form of payment rather than porridge, even if it does go well with the overall silliness of Defend the Highlands. The means by which you’re able to defend Alfredo includes sniping the offense with golf balls and getting your brave countrymen drunk on whisky, after all. There’s even a level where Nessie – yup, THAT Nessie – will assist, chewing up anyone foolish enough to near the water. Nom nom nom! Provided you have enough porridge to keep them fed, additional units can be recruited through the playing of bagpipes – an odd method, to say the least. Just make sure whoever you decide to turn into a musician is hidden somewhere in the back, as multitasking is not a thing in this game. Either a unit plays music, mans a tower (be it a porridge cannon, a set of golf clubs or something else entirely), or stands still, waiting for some poor fool to come within range, at which point… shots will be fired! Shots which may or may not hit the mark, depending on whether you’ve put points into accuracy over range, damage or even fire rate. See, while moving everyone around each battlefield, building defenses (which enemies can tear down with enough force, I might add), manning towers or oat fields will keep you plenty busy, you’d do well to ensure everyone hits boot camp between fights too. Far as I can tell, finishing a level rewards you with three upgrade points, which can then be distributed among a variety of ‘upgrades’, bolstering your troops for any and all future skirmishes. This is incredibly useful, as even on normal difficulty, the opposition can be quite relentless! From the relative safety of a pub full of tables and chairs to open highlands with a few rocks here and there acting as natural, unbreakable, defenses, there’s plenty variety across the 20-level campaign. A campaign which, for most, will likely take between four and five hours to finish, after which there’s fun to be had with the ‘skirmish’ mode. Here, you get to pick and choose, tailoring the encounter to your liking, changing things like enemy difficulty, disabling specific constructions and such. A nice change of pace after the this-is-how-it-is main missions for sure. Ah, and we mustn’t forget about the narrator / voice-in-the-sky, as this guy’s as over-the-top as the rest of the game, complete with a spot-on accent (because why not? ), acknowledging success cheerfully, and mocking equally upon defeat. On top of that, while the art style may not be to everyone’s liking, at least it doesn’t clash with the overall setting. Lush, grassy hills, bearded Scots, notes flying out from bagpipe players, and so on – quite lovely, eh? All in all, there’s definite fun to be had, no matter your skill (as the game packs several difficulty levels), defending these highlands. Could it have benefited from more visual polish? Probably, but what’s there works and doesn’t clutter up the screen, which is pretty darn important when things get going. On a related note, being able to disable order acknowledgment would have been nice, as hearing the same bits over and over can get a tad annoying. But given the overall fun I had with Defend the Highlands, that’s a minor gripe, really, and likely a case of personal preference. So go man those porridge cannons and get ready to snipe English invaders with golf balls! 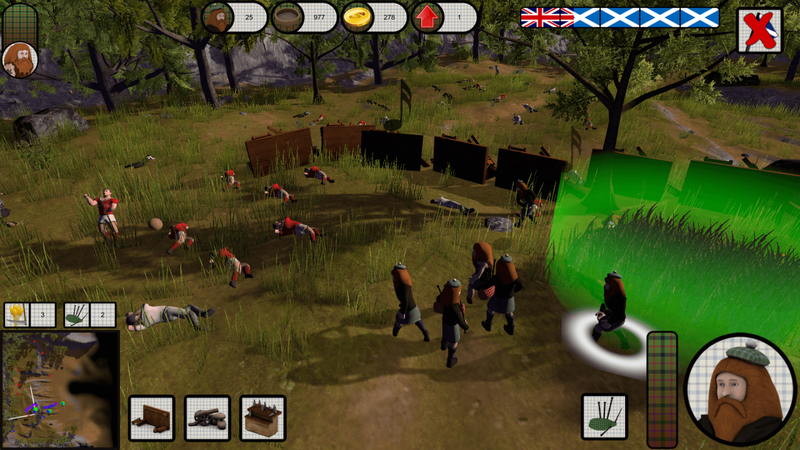 Defend The Highlands is available from Steam (Windows, OS X, SteamOS, Linux), with a $9.99 price tag.